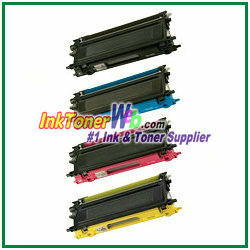 This compatible Brother TN115BK, TN115C, TN115M, TN115Y High Yield toner cartridges Combo Pack from InkTonerWeb.com includes 4 toner cartridges: 1 x TN115BK (black), 1 x TN115C (cyan), 1 x TN115M (magenta), and 1 X TN115Y (yellow). They are guaranteed to perform with your Brother DCP-9040CN, DCP-9045CDN, HL-4040CDN, HL-4040CN, HL-4070CDW , MFC-9440CN, MFC-9450CDN, MFC-9840CDW laser printers. They replace the original Brother TN-115BK/TN115BK, TN-115C/TN115C, TN-115M/TN115M, TN-115Y/TN115Y AND TN-110BK/TN110K, TN-110C/TN110C, TN-110M/TN110M, TN-110Y/TN110Y toner cartridges. Our compatible (generic) replacement TN115BK, TN115C, TN115M, TN115Y toner cartridges are made in ISO9001 & 14001 factories and meet the highest standards of quality, reliability and exceptional yields, offering high-quality printing results as OEM TN115BK, TN115C, TN115M, TN115Y toner cartridges.